2015-07-06 – Brussels’ second hotel overlooking the canal, the Belvue, appeared on a well-known online booking site a few weeks ago. A series of photos can be seen there of this trendy new designer hotel which has taken its place on the site of the former Belle-Vue brewery in Molenbeek. 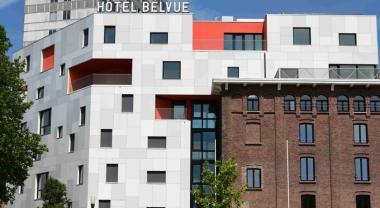 The hotel is part of a larger project supported by the Municipality of Molenbeek, with the support of the Brussels Region and the European Regional Development Fund (ERDF), involving the conversion of the old brewery site; the project also includes a hotel and catering training centre (see article to the left). It is also the next-door neighbour of the Meininger Hotel Brussels City Center, opened two years ago by a private investor who converted another part of the old brewery.